I know I will be called insane for what I am about to do. But you must believe me when I tell you that this museum is alive, infected with an ancient evil. Once these diabolical forces become manifest, they will reduce humanity to cinders. Night after night, I have scoured the exhibits and relics, fighting to keep the horrors at bay and learning what I can. I believe I have discovered a way to prevent our doom. Ancient cultures crafted a strange symbol to drive off these creatures. 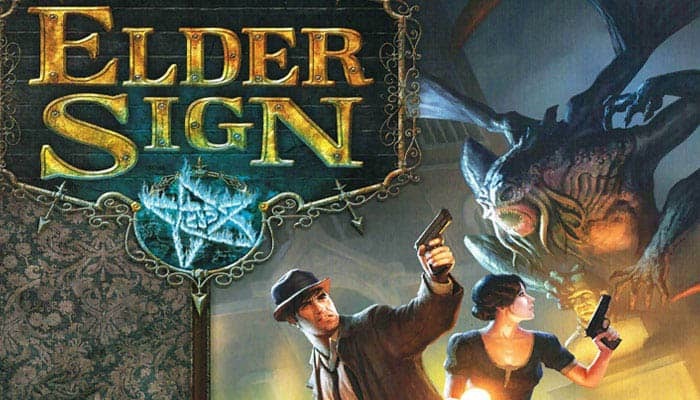 They called it the Elder Sign. It is 1926, and the museum's extensive collection of exotic curios and occult artifacts poses a threat to the barriers between our world and the elder evils lurking between dimensions. Gates to the beyond begin to leak open, and terrifying creatures of increasing strength steal through them. Animals, the mad, and those of more susceptible minds are driven to desperation by the supernatural forces the portals unleash. Only a handful of investigators race against time to locate the eldritch symbols necessary to seal the portals forever. Only they can stop the Ancient One beyond from finding its way to Earth and reducing humanity to cinders. To locate Elder Signs, investigators must successfully endure Adventures within the museum and its environs. A countdown mechanism makes an Ancient One appear if the investigators are not quick enough. The investigators must then battle the Ancient One. A clever and thematic dice mechanism pits their exploration against monsters and the sheer difficulty of staying sane and healthy, all within the standard game duration of one to two hours. The Clock is used to track the passage of time in the game and determines when Mythos cards are drawn. The clock hand is attached to the clock using the plastic connector. This sheet lists a number of abilities that players can use instead of attempting to resolve an Adventure card during their turn. The 6 green dice are usually rolled to complete tasks and resolve Adventure cards.